Sierra Bible Church (SBC) is a dynamic, inspiring, and rooted church with a city-wide reputation of cultivating the next generation of leaders in the Reno metropolitan area. We seek an energetic spiritual leader to equip and lead the youth and kids’ ministry of Sierra Bible Church. The ideal Youth and Kids Pastor candidate is a man who has a deep, growing relationship with God. He will be a strong leader and teacher with a passion for disciple making and equipping families to become healthy followers of Christ in an urban context. The successful candidate brings solid evangelical convictions to implement a fresh and lively ministry to youth and kids. SBC seeks a Youth and Kids Pastor who embraces a Christ-centered hermeneutic, can develop excellent systems of discipleship and outreach for children through high school, and communicate with multiple generations in an engaging manner. He will show strength and flexibility in leading ministry, be a team player, have the heart of a pastor, and be able to connect with a multi-generational church and community. A bachelor’s degree in a pastoral or theological field of study from an accredited evangelical institution and full agreement with the statement of faith of the Evangelical Free Church of America is a requirement. Prior pastoral staff experience is preferred. The Reno metropolitan area sits in the beautiful Truckee Meadows at the foot of the Sierra Nevada Mountains with easy access to Lake Tahoe. Reno is in the process of transitioning from a gaming destination to a tech hub. Tesla, Google, Amazon, Switch, and Rackspace have made large investments in Reno and are creating many jobs as an alternative to Silicon Valley. 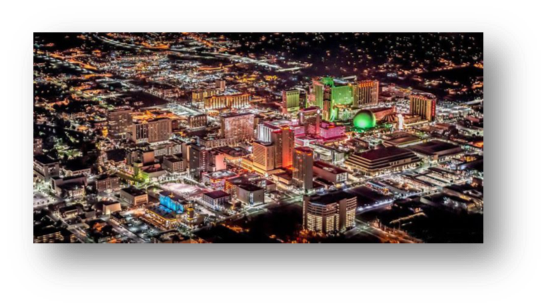 Reno is young, educated, outdoors-oriented, irreligious but “spiritual,” morally-permissive,wealthy, tech-savvy, and multiethnic. With increasing economic opportunities, the area’s population is growing rapidly without signs of slowing down. The roughly 440,000 residents who call the Reno metropolitan area home enjoy a wide variety of recreational activities including world-class skiing/snowboarding, hiking, fishing, entertainment, concerts, and arts. Reno is also home to the University of Nevada Reno, which has been ranked in the top 200 U.S. universities in the 2015 U.S. News and World Report rankings. If you believe God may be calling you to serve with us at Sierra Bible Church, please send your résumé to SearchTeamSBC@gmail.com. Bachelor’s degree in pastoral ministries or equivalent from accredited evangelical institution. Heart to equip families for Christ-centered living. Demonstrates Biblical qualifications for pastoral ministry (Timothy 3:1-7, Titus 1:5-9). Excellent communication skills including current social media platforms. Experience in event planning and leading special events. Experience in team building and leadership. Ability to evaluate kids and youth ministry curricula. Three to five year commitment to Sierra Bible Church. Called by the Lord to full-time ministry. equipped to lead their children and that young people have spiritual mentors. Collaborate with the Pastoral Team to ensure that there are opportunities for all generations to worship, learn, and serve together. Oversee the Sunday Kids’ ministry team including teachers, helpers, and curriculum implementation. Teach and lead The King’s Academy Chapel and His Kids’ Preschool weekly devotions. Connect AWANA, The King’s Academy, and His Kids’ Preschool to Sierra Bible Church discipleship. Teach, recruit, train, and lead Sierra Youth, including weekly student ministry gatherings. Oversee and minister to volunteer leaders, including parents, students and others. Organize discipleship and outreach special events.